Synopsis: This is the life story of Jason Pellew, or at least the story of that part of his life bounded by childhood at one end and early middle age at the other. The narrator is Henry Payne, who first encounters Jason when they are both young children and then meets him repeatedly thereafter: they both attend the same public school and are up at Cambridge at the same time, they both help to break up Blackshirts rallies in the East End in the 1930s and their paths cross repeatedly during World War Two. Jason goes off the rails after the war, ending up in court accused of having committed a range of minor felonies, mainly in an attempt to raise funds following a disastrously short-lived marriage to an exploitative older woman who takes him for a ride. Context: A friend of Nigel Balchin’s second wife Yovanka served as the model for Jason. One way to view The Fall of the Sparrow is to consider it a sort of compilation of the author’s “greatest hits”, as there are intriguing echoes here of his three great wartime books: Darkness Falls From the Air, The Small Back Room and Mine Own Executioner. Verdict: It’s a great read. 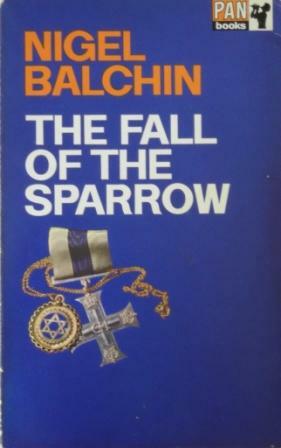 This is the most wide-ranging of all of Balchin’s major novels and one of the most consistently enjoyable. The situations are interesting and varied and the minor characters are good. The one slight disappointment is Jason himself: things happen to him and around him but he never quite comes to life himself. This could be because, as one critic said when the book first appeared, a neurotic fantasist such as Jason is essentially unknowable. Availability: It sold well (and was issued in a number of different paperback imprints) and thus should be fairly easy to find.